“The US suﬀers from large regional disparities in employment-population ratios (from here on, “employment rates”) which have persisted for many decades (Kline and Moretti, 2013; Amior and Manning, 2018). Concern has grown about these inequities in light of the Great Recession and a secular decline in manufacturing employment (Kroft and Pope, 2014; Acemoglu et al., 2016), whose impact has been heavily concentrated geographically (Moretti, 2012; Autor, Dorn and Hanson, 2013). In principle, these disparities should be eliminated by regional mobility, but this has itself been in secular decline in recent decades (Molloy, Smith and Wozniak, 2011; Dao, Furceri and Loungani, 2017; Kaplan and Schulhofer-Wohl, 2017). In the face of these challenges, it has famously been argued that foreign migration oﬀers a remedy. Borjas (2001) claims that new immigrants “grease the wheels” of the labor market: given they have already incurred the ﬁxed cost of moving, they are very responsive to regional diﬀerences in economic opportunity – and therefore accelerate local population adjustment.1 And in groundbreaking work on the Great Recession period, Cadena and Kovak (2016) argue further that foreign-born workers (or at least low skilled Mexicans) continue to “grease the wheels” even some years after arrival. In terms of policy, if migrants are indeed regionally ﬂexible, forcibly dispersing them within receiving countries may actually hurt natives as well as the migrants themselves. 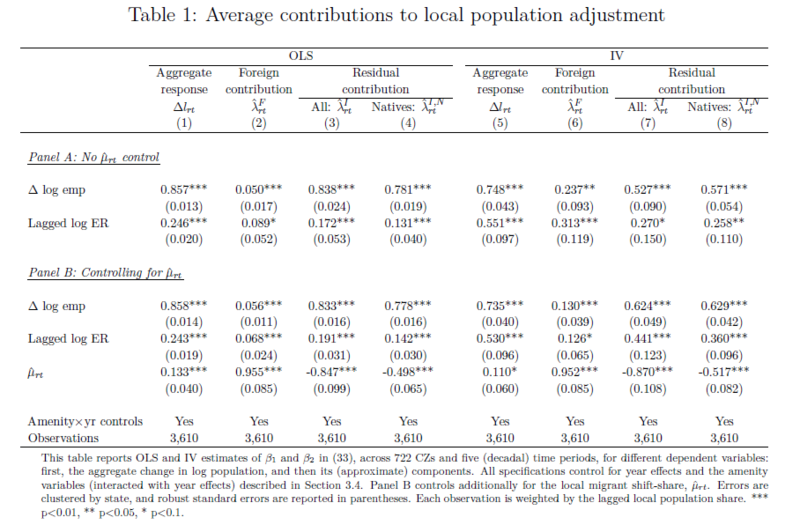 Basso, Peri and Rahman (2017) have extended the hypothesis beyond geography: they ﬁnd that immigration attenuates the impact of technical change on local skill diﬀerentials.